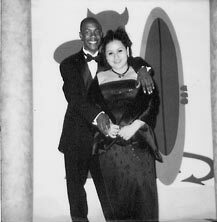 Odewayne Adams and Gaby Ticas Blair's After Prom Party in 2003.Odewayne is from Jameca and Gaby is from EL Salvador. Many students in Blair are from countries where they are used to seeing people looking the same. In their own countries everybody has the same looks, styles, culture, and language. But here at Blair High School, everything is different. People here are from different countries and have different looks, cultures, styles, and speak different languages. Therefore, the students have a chance to relate with people of different races. Some students find their "love" in their classes or in the hallway. They meet each other and then they begin a beautiful relationship, forgetting about the criticisms of other people. That was the case of Gaby and Odewayne. Gaby is from El Salvador and Odewayne is from Jamaica. "We met in the hallway and as soon as we met each other, we liked each other," Gaby said. Then they started going out, " He told me that I was pretty and he wanted to hook up with me." Gaby said. The same happened in the case of Grecia Bartolo. She is from Mexico and is dating a boy from the United States. "I think that it doesn't matter if he has a different culture than me," Grecia said. "What I am looking for, is if that person loves me and respects me and I love him too," she said. These couples hear much criticism from some people in school. "My friends told me that I'm supposed to be going out with a Hispanic guy, but I did not care about these comments," Gaby said. "I don't care about what people say. I only care about the love I feel for my real love, Gaby," Odewayne said. Students have different opinions about people of different cultures dating. "I think that some people go out with people from different races just to get the attention of people," Jaqueline Quisquinay said. But some other people see this from a different angle. "I'm not against these kinds of situations [for others], but I would not go out with anybody who is not from my same race," Silvia Cabrera said. "It's hard to socialize with people of a different race, especially those who can't express themselves in English like the way they speak [their own language]," Dona Criswostomo said. Some students believe it is good to have different experiences with different kinds of people. "When you love someone, it doesn't matter if [the person] is Hispanic, Black, White or from any other races, because love doesn't have limits," Sacha Philogene said. Some people agree with this idea. "I like to go out with people from different cultures and customs. I feel better than going out with people from my same race," a Hispanic girl said. Some parents also have a problem with their children dating people of another culture. "My father wants me to go out with someone who is from my own culture because he believes that it is going to be better for me to keep our family traditions," Grecia said. But other parents let their children make their own decisions. They think that their children have the right to choose the person they will live with together and forever. "My family saw from the beginning that he was a nice and respectful guy," Gaby said. "I did not get any bad comments from my family," she added. Love overcomes many different kinds of problems or circumstances. "Now we are still together and we know that our love is true and it's forever," Odewayne said. Gaby and Odewayne agree that love is love and doesn't have borders. It can obtain anything.